instead of using the die cut. The sentiment is a stamp from the Funkie Junkie Boutique. 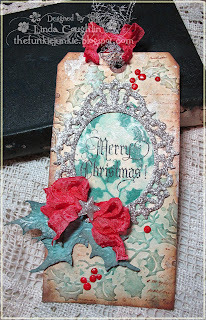 She has a great selection of Tim Holtz stamps! Sweet! I love polka dots and your red and white is so festive. Beautiful embossed frame and your crinkle ribbon is the perfect embellishment. Almost to the finish line, Jane! So glad you are still hanging in there with me!